The first photo of this coyote, taken when he arrived at AWARE in November, is difficult to look at, but just look how good this pup looks today! Treated for a life-threatening case of mange, he is now preparing for a spring release. It’s nice to know that there are people out there who will trap a coyote to get help for it rather than to harm it! When a group of unleashed dogs with their walkers spotted a family of coyotes relaxing at the bottom of a hill, the unleashed dogs went after them. These are the only dogs in this particular park that regularly pursue and search out coyotes, even when coyotes are not out in the open or within sight. The coyotes inevitably flee the harassers: thirty-pound coyotes aren’t much of a match for 60 pound Labradors. I can imagine that the coyotes tire of the intrusions and onslaughts. In spite of the tremendous screaming by the walkers, the dogs would not return to their owners until the owners physically went to retrieve them. One dog in particular was hell-bent on pursuing the coyotes — he’s the usual perpetrator of these raids and the leader of the rest of the dogs in that walking group. 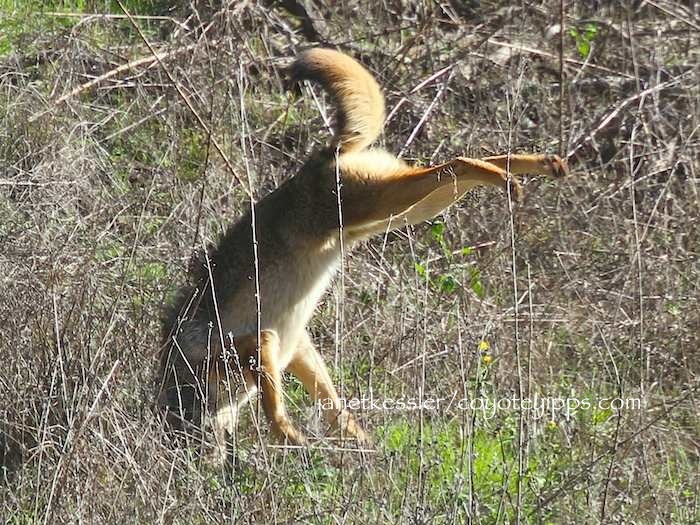 Today the male coyote youngster gave standing-up-for-himself a try. Dad was there as support, but it was the youngster who put himself out on the front line, heading the defense, while Dad sort of backed him up from further back and often from behind the safety of a small bush. Dad and the youngster coyote stood their ground defending themselves and their turf, and even, as a warning tactic, went on the offensive, darting in to message the dog to leave. When the dog found himself unexpectedly surrounded on both sides by coyotes, his movements became indecisive and he became at a loss about what to do. That is when the dog’s owner finally reached him, shooing away the coyotes and retrieving her dog. My hope is that the dog felt uneasy enough in the situation he found himself in so that he’ll have second thoughts next time about intruding on coyotes. Let’s see. Of course, if the owners had leashed their dogs — which they’ve often been admonished to do — the incident would not have happened. But these owners have no intention of leashing: “I never have and I’m not about to begin now”. This arrogance and amazing feeling of entitlement may not end up happily for everyone. What is interesting, as far as I have observed, is that younger coyotes often appear to be more willing to stand up to an intruding antagonistic dog than the oldsters. Today I came upon these three coyotes playing a frenzied, or maybe frantic, game of chase, or so it appeared at first. It is the family where the dad has been trying to get his son to leave the territory. Youngster was actually evading Dad in this chase pretty well, and he was having fun doing so — it appeared to be a game for him. But Dad seemed to have more of a purpose to his chasing. When Dad finally did catch the male youngster, he threw him down and I heard yelps of complaining pain from the youngster. The male youngster soon extracted himself from under Dad good-naturedly to continue the play, but I suppose the look on his father’s face dissuaded him from continuing. Instead, he fled away a few feet with tail under, ears back, arched back and back legs brought forward: this was a submissive run. He then sat facing away from his dad so there could be no eye contact and so he wouldn’t be confronted — but his ears were turned down and back, which still allowed him to keep track of Dad. Dad wandered off, and son got up and looked back at him leaving. Dad is putting son down after a playful chase: playful to the youngster, but maybe not to the Dad? Son then ran towards his supportive sister — see below. Notice his ears airplaned out to the sides, he is to the left. She has a stiff stance and her hackles were up initially. She allowed him to encompass her snout in his — this is fairly new behavior by both of them — and then they sat calmly together and just watched the goings on in the park before all three coyotes took off together. Coyotes love wallowing in, or rubbing on, smelly items — usually a dead rodent. They indulge themselves, unrestrained, luxuriating and taking pleasure in something the rest of us humans find rather repulsive. Dogs do it, too. Humans don’t have a handle on why this is so much fun. 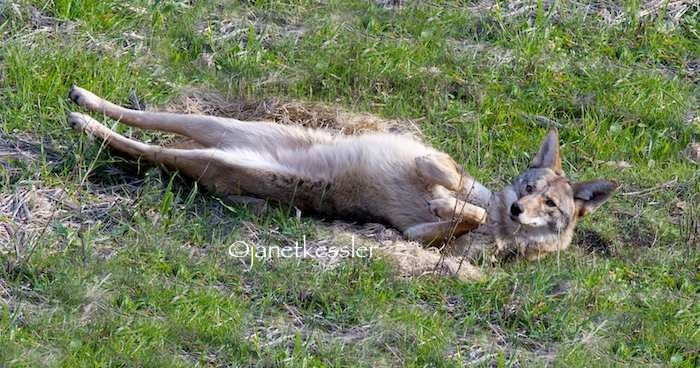 In this case here, the coyote is rubbing her back on something she likes, rolling back and forth, and stretching at the same time, trying to get as much “coverage” as possible. This time of year is when single coyotes who have not yet bonded with a mate are exploring beyond their natal territories, seeking out new areas to live either because of internal drives or because they have been kicked out by their birth families. At the same time, intact mated coyote pairs and their remaining offspring with established territorial claims are on the alert to keep these intruders out. 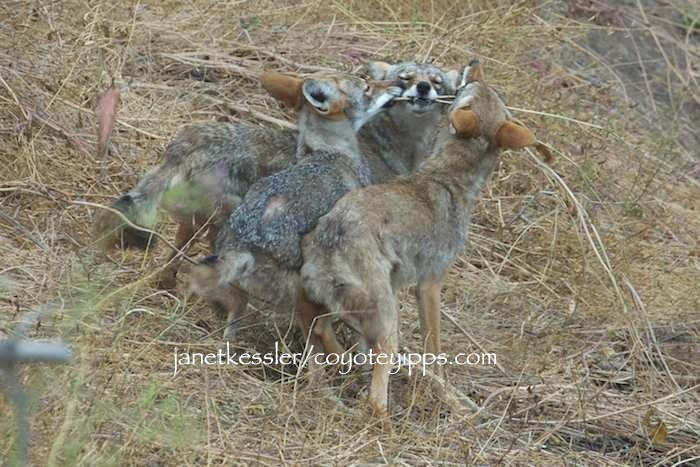 People with pet dogs need to be aware that this behavior towards other coyotes may also be directed at dogs. Coyotes may be on the lookout, especially during the next few months, for any canine that they think might want to move in and claim the territory: these include highly active dogs whose owners are not close to them. Their job is to dissuade these trespassers from moving in. All incidents can be prevented by keeping dogs leashed and moving on. Today in one of our parks, two long-time resident coyotes kept their eyes on two sets of dogs who were extremely active, not leashed, and not terribly close to their owners. In one case, a man was running with two smallish dogs which lagged far behind him. The running and generally active behavior of the dogs is what alerted the coyotes that these two dogs might not just be passing through. The coyotes at first just watched them, but soon they became anxious and agitated as revealed by their behavior: getting up, standing erect and pacing back and forth as they watched. As the two dogs and owner ran on, both coyotes bounded up to follow. As soon as the runner and dogs headed out of the coyote area, the coyotes calmed down. In the second case, there was one unleashed dog and owner who were fairly calm physically, but not necessarily psychologically calm. The coyotes and dog could read each other and, as instinct would have it, did not like each other: all canines seem to have an antipathy for one another: foxes, coyotes, wolves and dogs. The coyotes approached the dog within about 30 feet and there was minor but perceptible intimidation on the part of both the dog and the coyotes. I told the owner not to let his dog go after the coyotes, at which point he grabbed his dog by the collar and walked on. A human right next to a dog will dissuade coyotes from approaching. To prevent any antagonistic incidents during this season — rare though they might be — it is very important for dog walkers to be aware of their surroundings and aware of what season it is for coyotes. When they see a coyote, they need to leash up immediately and walk on, away from the coyotes. This serves as a safety measure for both dogs and coyotes, and it is respectful of wildlife which is only following its instinctive behaviors. If a dog and coyote engage at a closer range, it can be pretty scary, because neither coyote nor dog will respond to an owner. 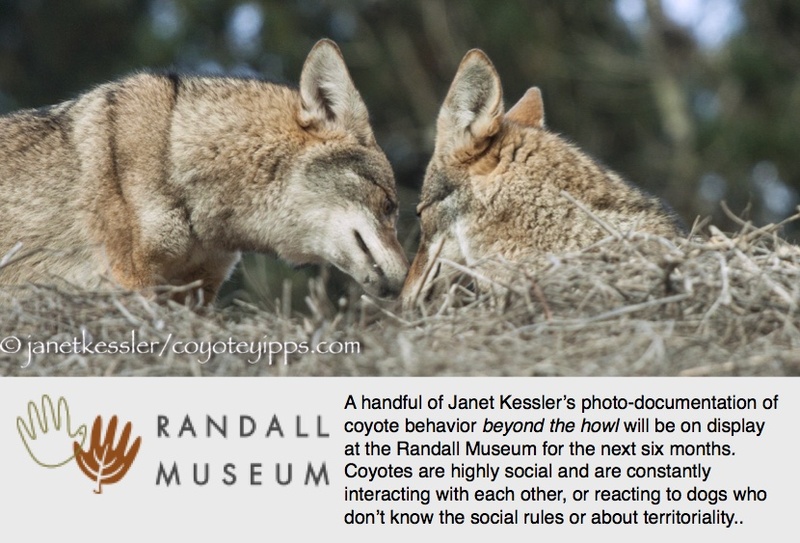 The coyote may even message its antagonism with a nip to the dog’s haunches. If there are two coyotes, a dog may become baffled by the situation and not know what to do. The owner needs to move in and grab his dog quickly — but not if the coyote is too close to the dog and the dog is responding with bared teeth. Neither the coyote’s nor the dog’s intention is to bite the owner, but as the coyote attempts to message the dog and vice-versa, the owner could get scratched or bitten by dog or coyote. Please remember that these incidents are rare: the number of bites or scratches from coyotes to a human, usually because of this situation, amounts to about 17 a year for all of North America, whereas bites to humans from dogs sends 1000 humans to emergency rooms every single day. We all can prevent this eventuality by following simple guidelines: keep your dog leashed in a coyote area, if you see a coyote, move on and away from it, know how to shoo off a coyote if it is approaching. Kicking Up Her Heels For The New Year! Here are photos of a calm day — except the kicking-up-her-heels part. She’s actually kicking up her heels in a hunt after lolling around, doing absolutely nothing, all morning in an open field. And even this little amount of activity was low energy and not too exciting since it didn’t result in a hoped-for lunch, so it was really a very mellow morning. Anyway, it was the sunshine which was so delicious on this day, and this coyote took full advantage of it, soaking it up for the entire morning before wandering into some bushes and out of sight. This is a happy coyote. Thank you San Francisco for supporting our wildlife. Hopefully more of our urban and non-urban coyotes throughout North America will be able to live this way in the coming year and years to come, without it leading to a death sentence as it has in some communities. Although not nocturnal animals, coyotes keep themselves hidden from view, by and large, during daylight hours. However, there are some coyotes who, on a regular basis, enjoy resting and sleeping right out in the open where they can be seen, as long as they are not pursued by dogs and as long as their space is not intruded upon by humans.